This is a very simple recipe, really. It doesn’t take long to throw together, and is quite forgiving. You can toss in any stray veggies laying around in your refrigerator, and substitute the chicken with any protein you desire (mushrooms are an excellent vegetarian option!). This dish reminds me so much of the hearty beef stews I grew up enjoying…and believe it or not, I don’t even miss the beef (for the record, we don’t consume beef in our household; so even if I did miss the beef, I’d have to get over it rather quickly). Because not everyone has the opportunity to enjoy an authentic meal in an Indian household, I thought I’d share a home-style recipe here, on my blog. Now, don’t be confused by the word bland. This curry is anything but bland. It’s just not all that spicy (hot)–but, you can definitely add chili peppers if you’re feeling a little wild or adventurous. 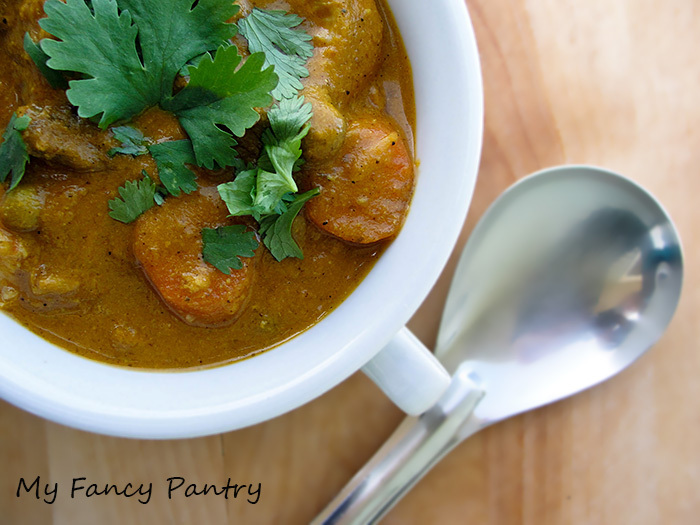 This curry also doesn’t include any fancy whole spices (cinnamon, clove, cardamom, ect…) or any cream. Although, I do toss in a bay leaf–for good measure. 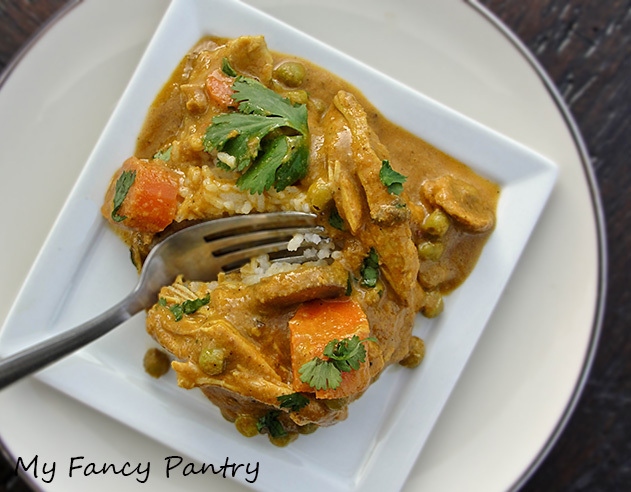 I made this curry using skinless and boneless chicken thighs. 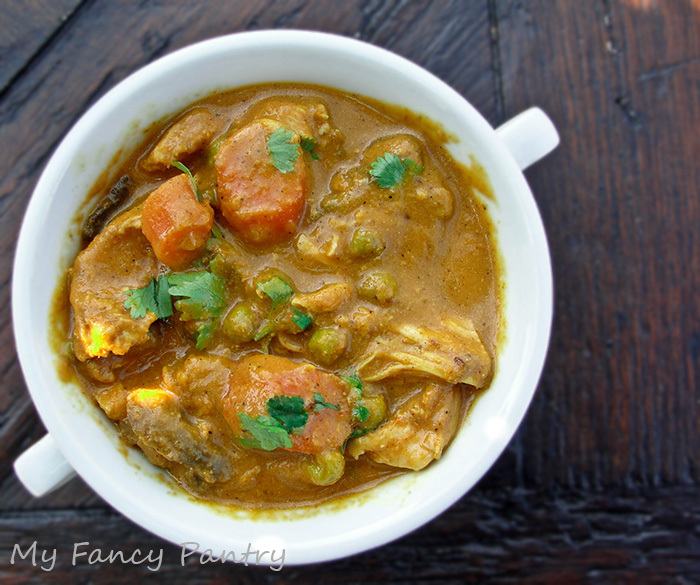 In India, you’d make this curry using a whole–cut up–chicken; but I didn’t have one on hand. The meat–whether you are using chicken, lamb, or even fish– is usually cooked on the bone, as this lends incredible flavor to the gravy. Because my chicken thighs were boneless, I added chicken stock–instead of water–to thin out the curry. This simple substitution really adds a lot of flavor that the curry would otherwise lack. If you do use water, rest assured. Your curry will still taste good; it just might be a little flat–for lack of a better word. The photo is a little blurry, the hot steam coming off the curry was keeping me from getting a crisp shot, but you get the idea. If you’re really going for a rustic presentation, you can continue to cook this until the tomatoes completely break down; but what I like to do is to dump the mixture in my blender (remove the bay leaf). I just prefer the masala to be a little smoother and less chunky. Either way, it’ll all taste about the same. At this point, I’ll leave the blended gravy to the side; and toss a little oil back into my dutch oven. I sear the chicken. 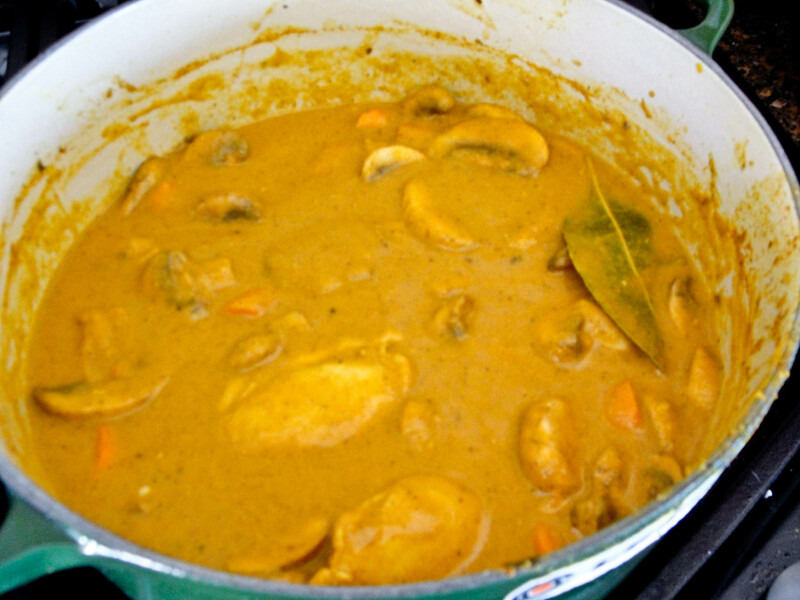 Once it has nice color, I dump the gravy and a little chicken stock back into the dutch oven–right over the chicken. Then I give it all a little stir. I toss the bay leaf back into the pot, and add any vegetables I want to use. This time I used a whole package of mushrooms, 3 sliced carrots and about one cup of frozen peas. I also have a little taste and adjust the salt/black pepper. 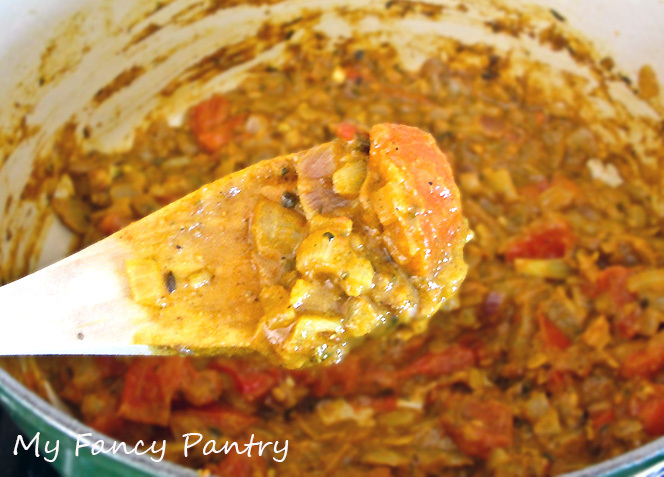 Although this curry can be cooked relatively quickly, I love to cook it low(er) and slow(er). I turn my flame to medium, toss the lid back on the pot and let it all cook one to two hours–checking every 30 minutes and adding additional stock, if needed. I like to cook it this way because it ensures the chicken is nice and tender. It’ll fall apart, actually. 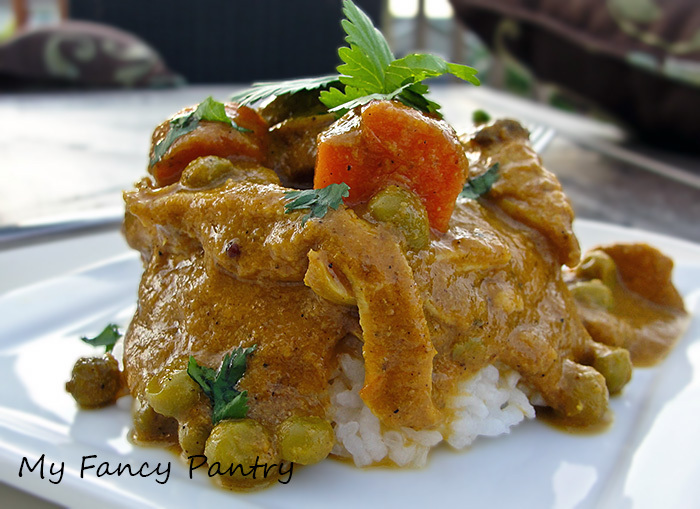 It also helps to develop the unmistakable “curry” flavor. Using one large pot with a tight fitting lid, heat oil over medium-high heat and add 1/2 tsp. cumin seeds. Once they begin to pop, add the diced onions and fry until the pieces become translucent. Add the ginger and garlic pastes. Keep stirring. Add all the quantities of ground spices, and the bay leaf. Keep frying. The mixture should be quite dry and begin to stick to the bottom of the pan. About three minutes. Add the chicken to the pan and cook on high-heat for about 5 minutes, until the chicken has fully browned. Add any vegetables you are using at this point. Turn the heat back to medium-high and add the tomatoes to the pot. Add about 1 cup of chicken stock (or water) and simmer until the tomatoes have cooked down. Add the whisked yogurt. Stir it all together and then bring the mixture to a fierce boil. Put the lid on the pot, turn the heat to medium and simmer for about 1 to 1 1/2 hours–checking and stirring every 30 minutes. Taste and adjust the salt-level. Add additional chicken stock if the curry has become to thick. Garnish with freshly chopped cilantro and serve with rice. By the way, check out your local thrift stores. I’ve found Le Creuset pieces for as low as $2.50!!! Lucky– that’s a nice thrift store find! I already have a ridiculous Pyrex bowl collection from thrift stores, and a thrift store dish-buying problem in general, but have rarely come across anything Le Creuset… I guess they always get snapped up pretty quickly! That looks really amazing – I can’t quite describe to you just how much I adore a good curry and that looks particularly good! 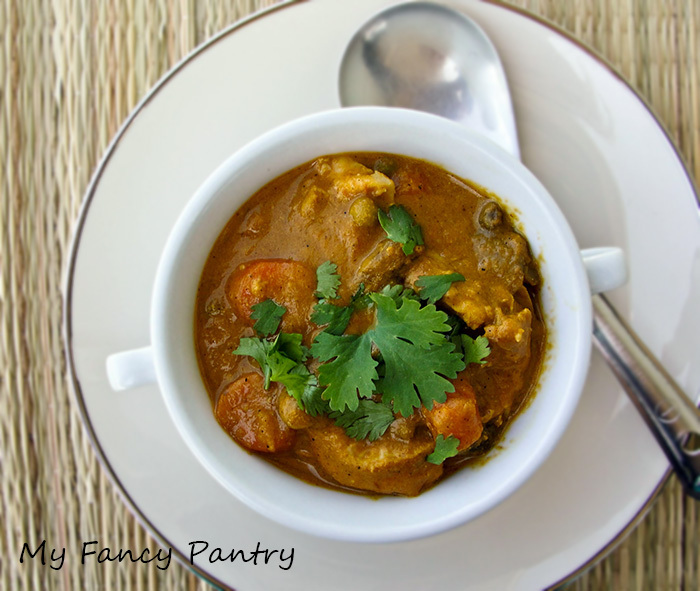 Shari that looks delicious – I’ve been craving curries like this in all the cold weather we’ve been having! Thanks for liking my last post– fennel, apple sausage pizzettas! Masala from scratch?? I’m impressed and delighted! Great recipe! I just stocked up on some Indian spices so this looks absolutely perfect to put them to use. You and your blog are fabulous! Thanks, will post it shortly. This sounds amazing. Thank you for all your recipes. We moved to a small town a couple of years ago and it does not have an Indian Restaurant. Your recipes make it easy to make yummy Indian food. THANK YOU! 2 questions – Would it be okay to leave the yogurt out in this recipe? (We don’t eat dairy) Do you think the recipe would work in a crock pot? yes, and yes! 🙂 In fact, I skip yogurt a lot of times too. I’ve never made it in a crock pot, but I’m absolutely sure it would work. 🙂 Give it a try! …and you’re more than welcome for the recipes. Is there any dish you’d really like to know how to make? Definitely trying this. I’m having a craving for indian spice at the moment. We don’t have a very strong Indian culture in Ireland so getting an authentic meal in a restaurant is close to impossible as they tend to pander to our Western tastebuds. Can’t wait to try this. I’m so happy you liked the Chicken Masala! Lovely recipe, thanks very much for posting it. I did mine in the slow cooker for 6 hours after browning the chicken and used a tin of tomatoes because I’m lazy! This meant no need for extra stock or water but I still put in a stock cube, even though my chicken was on the bonce. I’ll definitely be making it again. I’m so happy to hear that the recipe worked for you! I love your idea of cooking it in the slow cooker, I may have to try that. Hey, I was desperate to cook something for my husband today and landed on your recipe! Thanks so much for the same! The taste is excellent. I have to say I changed a few things but it was yum! Do you have other simple recipes as these? I’ve only recently started cooking so still finding my bearings 🙂 thanks once again! Look forward to more yummy stuff. I’m glad you enjoyed the recipe! Check out my recipe index (you can find it on the menu at the top of the page) for other quick and easy recipes.